Whether you are planning a small business meeting, dinner reception, a large-scale tradeshow presence or any other type of internal or external corporate event, there are important factors to consider. 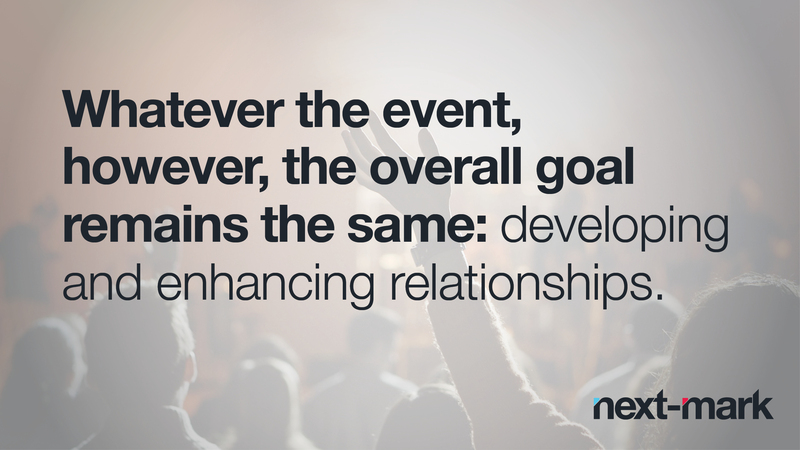 Whatever the event, however, the overall goal remains the same: developing and enhancing relationships. To help you achieve that goal, here are 10 best practices to guide you in creating corporate events that shine the best light on your organization and make others’ participation worthwhile. 1. Communications Strategy: Have a solid strategy for the event, with a clear view of what you hope to achieve. Make sure your message is clear. Tell invitees what they can expect at the meeting, who will be presenting and what they stand to gain. Tell them how they will benefit, that is, will it help them solve a problem, enhance their knowledge or skill set, access key leaders in the field or simply enjoy themselves? Plan your communication campaign well in advance, giving attendees plenty of time to learn about it and meet registration or RSVP deadlines. If you have a hotel room block secured, work backward from cut-off dates to build interest and fill rooms. Know your audience and the types of communication to which they most likely will respond. From on-line hype videos to old-school direct mail, put together an arsenal that will work for that audience and your event. And don’t forget about your post-event communications to further grow those relationships. 2. Vendors: Lock in third-party vendor contracts early in the process. You don’t want any question as to their commitment to your event. This includes the hotel room block, speakers (and their travel/ hotel accommodations), catering service, banquet space or restaurants, meeting space, transportation service, audiovisual equipment team, bartenders and whatever else it will take. 3. Content: Make your event count with fresh content. It’s important not to take your attendees out of their offices for events with the same information year after year. Ensure the material is new and relevant to their needs. Are there any new systems, products or strategies your attendees need to know about? Are there industry trailblazers from outside your organization who can offer new insights and inspire attendance? For external events, everyone from your company should be well versed on your core messages to assure that attendees walk away with a clear vision of your brand. Your brand strategy should be integral with the event, consistent in messaging from beginning to end. 4. Event Strategy: Organize the information. It really helps to have a dedicated employee to coordinate all logistics in one place. Having too many cooks in the kitchen can cause confusion. This person keeps track of guest arrival and departure times, travel information, hotel rooms, special requests, contact information, intel about each guest, meal choices, special needs or dietary restrictions, emergency contact information and any other important information. Once on site, make sure all staff helping with events has this detailed information readily available. Having all of this information in an organized binder with the manifest, extra copies of agenda (and having more than one copy of this entire binder) is extremely beneficial during the event, especially if it is large enough to require multiple staff members to run it. There is nothing worse than staff that cannot respond to a guest’s needs. Event staff members should be “walking information booths” who can answer questions or at least be able to look it up in an accessible place. Staff helpers should have regular meetings before an event to walk through every step of the event, work out wrinkles and assign clear responsibilities. 5. Attrition deadlines: When securing hotel accommodations, special attention must be paid to the attrition clause in the contract. Attrition can be a costly and unnecessary expense, as your organization will be held responsible for unused room nights. This can be avoided. A best practice is to offer incentives such as a discount for early reservations so you can meet your cutoff dates. Make the registration deadline a week to 10 days ahead of the cutoff so you can release any rooms from your room block by then. There will always be last-minute registrants trying to get their names on the rooming list, so you might want to leave a few rooms open. 6. Environment: The environment should be visually stimulating, comfortable and impressive. It also should match the intention of the meeting. How well you run an event is representative of how well you can run your business, and the ambience can paint a picture of the service prospects stand to gain. Some questions to be answered when attempting to roll out the red carpet within budgetary limits: Is the area and or seating comfortable? Is the temperature too warm, too cool? Will you provide a strong WiFi signal for the convenience of guests? Are the A/V tools you need for your meeting working correctly? If not, is there someone available who can assist so that your presentation runs smoothly and seamlessly? Are the bathrooms easily accessible and are there enough? Will you have a clean-up crew to manage trash? Have all of this sorted out BEFORE the event. 7. Networking: Sometimes conferences are so jam-packed that participants don’t have enough time for networking and engaging in important conversations that may come up. Don’t forget to carve out space for this. If offering a multiple-day conference, leave one night open for smaller group dine-arounds to provide networking opportunities. Always include a Q&A session. Consider small-group discussions to explore how participants might implement key strategies or takeaways from the topics and speakers. 8. Cost Control: With events, costs can get way out of control fast! One of the ways companies can stay within budget is by planning well in advance. Reserving a meeting space or room block well in advance is going to secure better pricing. Additionally, if you plan multiple events each year, you might consider establishing an agreement with a hotel or event space to secure a corporate rate, rather than a variable rate. If you’re ordering promotional giveaway items at your event, can you buy in bulk for multiple events to secure a better price-per-item ratio? If your audio-visual needs are too expensive, is there equipment you can purchase and set up on your own instead of renting? Food and beverage too pricy? Is there a deli that does a knock-out job on catering and food presentation? Cost-sensitivity for guests should be a consideration, as well. If your guests are responsible for expensing their own hotel and travel, choosing the right hotel is crucial. 9. Things to “Know Before You Go”: This is a necessary one-to-two pager you send to registered guests prior to the event, giving them detailed information. Participants need to know exactly what to expect when they arrive, where to go, start times, special instructions, etc. This should be emailed (or posted on an event website) a minimum of two weeks in advance. Include airport and hotel information (include WiFi codes), parking, transportation information, meal locations (and hours), dress code, items to bring, information on outings and, most important, contact info. Make sure to include the cell phone number and email address of the event coordinator’s and any other needed contacts. Is there an event station or registration booth they need to check-in with as soon as they arrive? Don’t leave them hanging for any part of the event, wondering what to do or where to be. 10. Making it Memorable: Do something that is unique, fun or thoughtful that will make them remember you. I once attended a barbecue reception at the Ritz, where I received a bottle of pork rub spices the sponsor had put together themselves, with The Ritz monogrammed on the container. I will always remember the event and the woman who prepared the bottles because it was such a nice touch. (I went home and made chicken that weekend with the spices, and it was delicious.) You might want to have a welcome committee greet attendees at the hotel (or pick them up at the airport) and give them a gift bag with a few essentials, such as bottled water, a small snack pack, notepad, pen and a giveaway branded item, such as a luggage tag, a voucher for a free glass of wine or appetizer somewhere within walking distance or a power bank to charge a cell phone. (Functional items are better than tchotchkes.) Ask yourself: What can you do for them that makes them feel like you know who they are and you care? The answer can take you far.